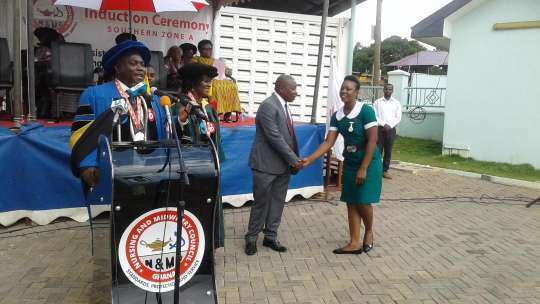 The Nursing and Midwifery Council of Ghana, has honoured Ms. Sophia Safia Sulemana, a midwife at the Kunkwa Health Centre in the Mamprugu Moaduri District of the Northern Region, who delivered a pregnant woman of a baby while on board an Accra-Bolgatanga bus. Ms. Sulemana who was part of the new inductees of the N&MC that were inducted into the health profession on Monday in Accra, was said to have delivered the pregnant woman of a baby boy at 3:00 am while on board the bus on Sunday, September 23, 2018. She was said to have used improvised polythene bags as gloves to receive the baby, got a blade from a passenger to cut the umbilical cord of the baby, and pulled out a string from a sack to tie the cord. “The news of her professional display got to our attention through social media. Upon further enquiries, we established the veracity of the story and invited her to our head office in Accra to officially commend her,” the N&MC said in a release issued and copied to the GNA in Accra. Narrating the incident at the induction ceremony amidst applause from those gathered, Ms. Sulemana indicated that there was pregnant woman in the bus she boarded on Saturday 22 September 2018 going to Tamale for antenatal care on that fateful Saturday. She noted that, she did not want to monitor labour on the bus so she asked the driver to speed up so that they could get to a nearby health facility. It was there that she realized the baby‘s head was coming out of the vaginal opening. She got assistance from two other women on board the bus. “I quickly asked for polythene, which I used as gloves because I had none on me. After l delivered the baby, which was a bouncy baby boy, the baby cried and that was my greatest joy because when a baby is delivered and he doesn’t cry, something might have gone wrong,” Ms Suleman recounted. The next hurdle was to separate the baby from the mother by cutting off the umbilical cord; she used a new blade to cut off the cord. He later presented a motorbike, a hospital kit and a citation of honour, on behalf of the Ghana Health Service and the N&MC to Ms. Sulemana for her timely intervention in the situation. Meanwhile, over 5,000 nurses, nurse assistants and midwives who sat for the Nursing Examination, passed and qualified in 2017, were inducted into the nursing profession.